2238 BOPP Tape: Bioxially Oriented Polypropelene (BOPP) Film coated with acrylic based adhesive in different micron (gsm) coating thickness. The BOPP tape is available in different colors. BOPP tape is used in carton box sealing and for stationery purpose. Printing of single and multiple colors is also possible with logo or customized design. 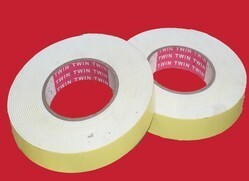 2231 Cellophane tape It is a clear transparent tape with cellulose film and natural rubber adhesive. The tape comes off without leaving any adhesive residue. 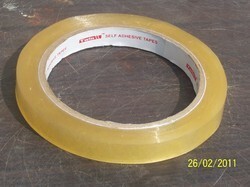 Cellophane tape can be torn by hand and is convenient to use without a dispenser. Applications Packaging, covering and masking, film splicing, temporary holding of laminates, holding of yarn in power loom, plastic film welding etc. # 2228 Aluminum Foil Tape It is a specialty tape designed for mounting of refrigeration coils and other similar applications. It is a dead-soft aluminium foil tape coated with a modified acrylic adhesive system and with an easy-release paper liner. It is highly conformable resulting in easy application over the refrigeration coils without rupturing. The adhesive system is stable over wide temperature range, making it ideal for application in refrigerator, coolers, etc. 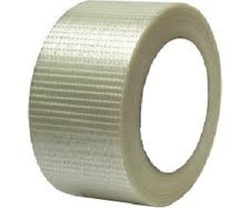 It acts as an excellent barrier to moisture and prevents damage to the coils from PUF.
. # 2222 D/S Polyester Tape It is transparent double sided adhesive tapes consist of transparent polyester film with modified acrylic adhesive system. It has an easy release paper liner. 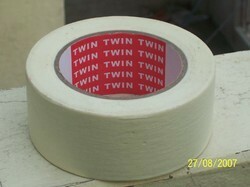 The tape is very thin and offers a good tack and high shear resistance hence ideal for splicing application. Red color is also available on demand.Applications Mounting of badges and signs made of metal or plastic, splicing of thin plastic or metal films, used for core starting application bin film manufacturing & processing units, for manual splicing of films like polyester or BOPP at rerealer & rewinding station of film manufacturing and processing units. 2226 Floor Marking Tape: It is a plasticized PVC tape coated with an aggressive modified rubber-resin adhesive, which is lead free, good adhesion to most surfaces, distinct colors code for safety warning and marking, remove without adhesive residue. It also has good resistance to solvent, oil and water. Applications: It is suitable for line marking to delineate lanes and opening, hazard warning to identify potential risk area and safety zone. 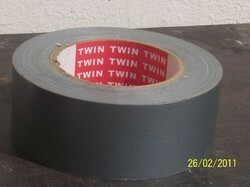 2229 Duct tape It is a polyethylene laminated mesh cloth adhesive tape with high flexibility and conformability. 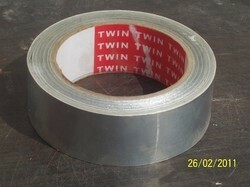 This tape is suitable for duct work and general purpose. It is widely used in Aerospace, Automotive, Electrical, Heating Ventilation and Air conditioning (HVAC) and Construction industries. It has good adhesion even on rough surfaces, waterproof and easy to tear by hand. 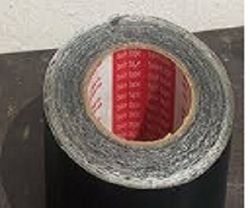 asbestos removal, sealing of rubbish bags, fixing, closing, packaging and a lot more..
2233 Masking Tape It is an economical creped paper tape suitable for general purpose masking, bundling, holding, sealing and surface protection applications. It is recommended as a light duty packaging tape. 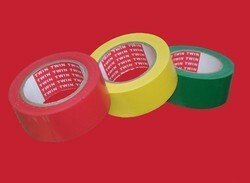 Application Masking, labeling, sealing, holding and light duty packaging.
. #2224 D/S Cloth Tape: This tape is made out of cloth and is coated on both sides with strong natural rubber adhesive which also has masking properties. 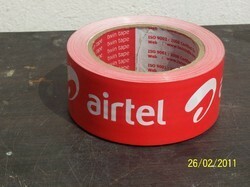 This tape is laminated with polyester or paper release liner. 2223 D/S Tissue Tape: It is a double sided mounting tape equipped with a light weight tissue paper backing and coated with an acrylic adhesive of very high tack and resistant to light and aging. 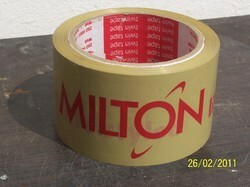 This tape is used in shoe and leather industry, foam industry, postal service, decoration, label and lot of other uses. Applications: Lamination of nameplates and logos, fixing of front facia plate, mounting of plastic door linings in the car industry, fixing of garment labels. 2230 Filament Tape (Mono & Cross): This tape has fiberglass reinforced backing, very high tensile strength and not easy to break. It can be used against steel straps for heavy duty packing and mounting of articles in white good industry. 2235 Surface Protection Tape: Self-adhesive surface protection tape has excellent protection against damages and scratches. 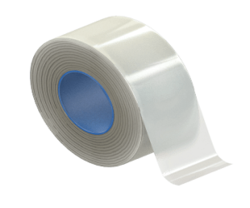 This tape has adjustable peeling force, no adhesive residue and weather resistant. Application: ¿¿¿¿¿¿Surface protection of plastic components, painted sheet metal components, ABS components, glass, laminated wood panels etc.